NATIONAL ASSOCIATION OF REALTORS® Launches new trademark campaign. Let "That's Who We R®” be your rallying cry, an expression of pride in your work and the many ways you go above and beyond to improve the lives of your clients and communities. “That’s Who We R” serves as a reminder of what NAR has always stood for while signaling where the organization is heading. For REALTORS®, the campaign is a rallying cry that instills pride in their everyday actions. For consumers, it’s an education about the REALTOR® difference. Since the campaign reflects our stories, share yours! Visit That’s Who We R® and tell us how you launched your career. Each month at the site, you can answer a new prompt and be inspired by other members’ stories. That’s Who We R® celebrates you as a trusted professional, helping to advance your business and championing you – and the REALTOR® brand. Plus, new this year, you have access to campaign materials for use in your own marketing efforts. At That’s Who We R®, you’ll find links to the campaign ads and TV spots, social posts, and print and digital media – some of which can be customized with your business logo. 36 members of the Northern Kentucky Association of REALTORS® (NKAR) attended the Annual REALTOR® Rally in Frankfort Wed. Feb. 13th, 2019 joining REALTORS® across the Commonwealth to advocate for Kentucky Homeowners, private property rights and the real estate industry. 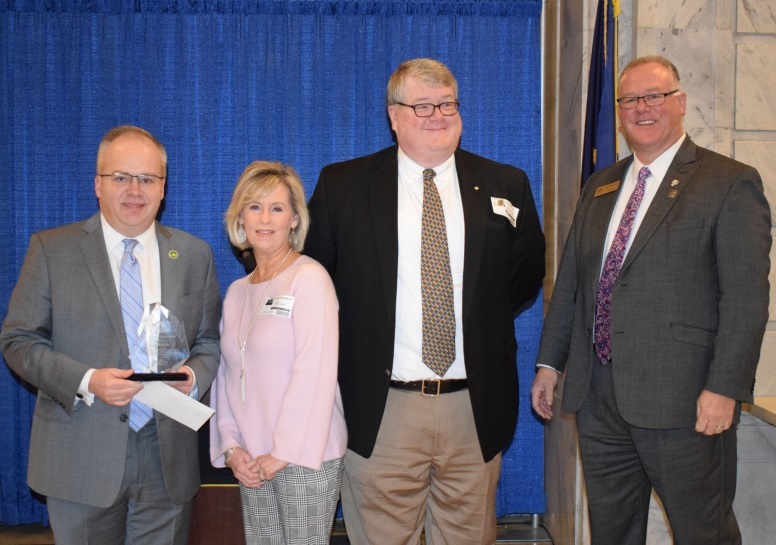 Kentucky REALTORS® awarded Representative Adam Koenig an NKAR REALTOR® member with its highest legislative award the Jess and Carolyn Kinman Award for his efforts as Co-Chair of the House Licensing and Occupations Committee and his involvement with House Bills 2, 329 & 465 from the 2018 General Assembly. As part of the award, First Federal Savings Bank of Frankfort makes a charitable donation in the name of the award recipient. This year, Rep. Koenig selected the Salvation Army of Covington. The award is named in honor of Jess Kinman, a former Kentucky REALTORS® president and REALTOR® of the Year who passed away in 2007, and his wife Carolyn Kinman, who worked for many years at the Legislative Research Commission and General Assembly.